We have a huge selection of garden trellis for you to choose from, varying in both style and design. 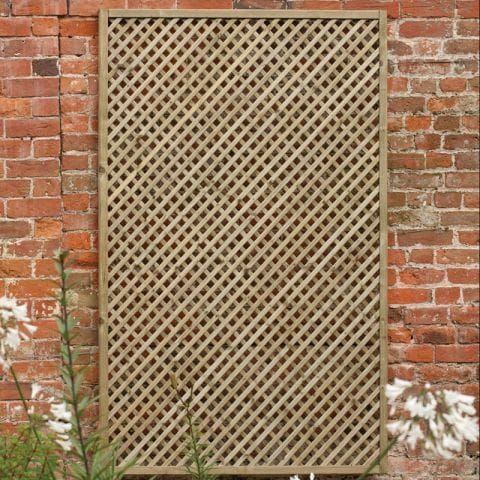 Not purely designed for aesthetics, our trellis panel range is built to last too. Our high-quality panels are fitted into substantial framework to ensure they remain rigid and strong. Furthermore, all of our products are pre-treated; we offer substantial guarantees against both rot and fungal decay of up to 15 years. Don't forget about our fantastic 'pick-a-day' delivery service either; we offer free delivery on all of our garden trellis panels to the vast majority of UK mainland postcodes on orders over £100. At Fencestore, we’re delighted to offer our customers a wonderful range of high-quality, affordable, and attractive garden trellis panels. 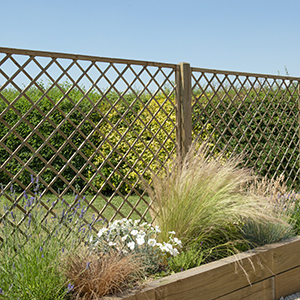 Our innovative trellis fencing range will help you to create stunning garden boundaries. Considerably more stylish than standard fence panels, trellis fencing will add a touch of style and class to your garden. We have a range of different sizes available too, from smaller 3ft panels, perfect for usage in front gardens, all the way up to larger 6ft panels. Not just for garden boundaries, you could also use trellis fencing to partition your outdoor space or, alternatively, obscure an unsightly area from view. 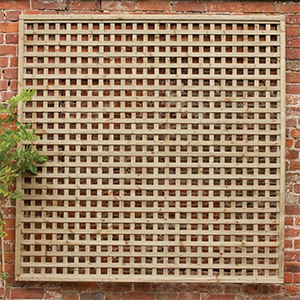 Revitalise featureless, bare brick wall with our superb wall trellis. Simple to install, you can attach trellis panels with a masonry drill and appropriate screws. In order to complete the display, we highly recommend adorning the panel with bright, colourful climbing plants; some options well worth considering are roses, clematis, and honeysuckle. We're sure anyone who visits your garden will be suitably impressed by your walls' transformation. Our experts are always happy to provide some pointers if you'd like any advice on using our wall trellis. No garden can be considered complete without the addition of a rose or two; they are, without doubt, the most quintessentially British flower. What better way to display them than with our rose trellis panels? 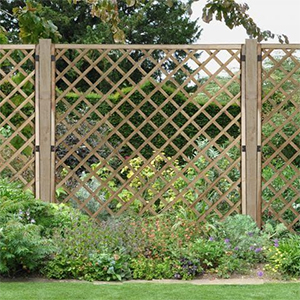 Purpose-built to support the weight of a heavy, mature flower, our climbing rose trellis panel range features thick battens for extra strength and durability. Larger holes are also incorporated into the design, to ensure the rose has the space to grow freely. Why not decorate your garden with some attractive rose trellis? Finish off your garden fencing run with our fence top trellis. Fence toppers add extra height to your panels, increasing your sense of privacy and security. They also add a touch of class and style; most garden boundaries don't feature such attractive designs. 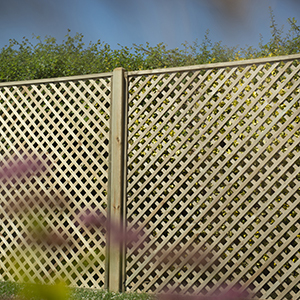 Simple to install, and affordable too, what's not to love about our fence top trellis? As they are constructed from dip-treated timber, these panels will look fantastic with our popular dip treated fence panels - overlap, feather edge, and close board are the most popular. To install garden trellis properly, you'll need to head over to the fence posts and fencing acccessories sections of our website. Here, you'll find a range of useful products, including posts, brackets, clips, spikes, to help you construct a run of panels. Figuring out which posts to use with which panels, which brackets are compatible, and which post caps will look best, can be a tricky task - but, don't worry, our cheery staff will be able to assist you. 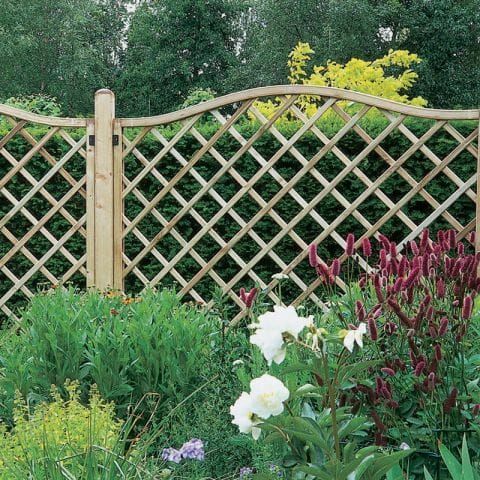 The vast majority of our trellis panels are wooden; our range covers a variety of styles and sizes too. We offer two different types of wooden trellis: dip treated and pressure treated. 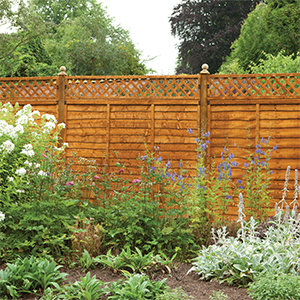 Dip treated wooden trellis panels are the cheaper of the two options, coming complete with a 10-year anti rot guarantee. However, these panels will require a coat of treatment upon erection and annually thereafter with a good quality wood preservative. 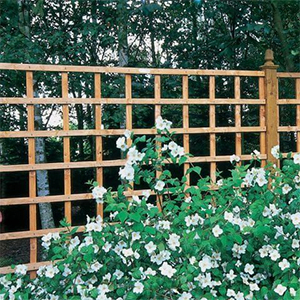 Pressure treated wooden trellis panels is slightly more expensive, but instead features an impressive guarantee of 15 years against rot and fungal decay. Plus, there's no need for any further treatment, saving you time and money in the long run.